Product Name is pretty self-explanatory. The organization name can be whatever you want, but it probably should the the company or name you are releasing your apps under. 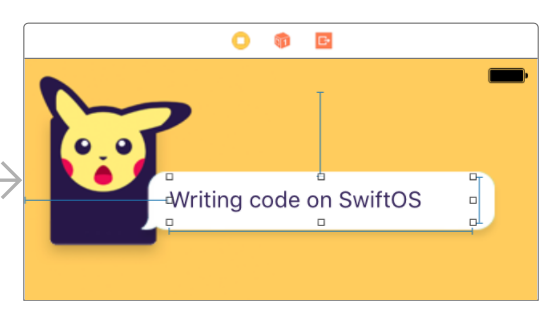 Continue by selecting a location where you will save the project and after you click the “Create” button, the files for your project are generated and you are probably looking at your AppDelegate.swift file. Go to File > New > Target > Intents Extension. 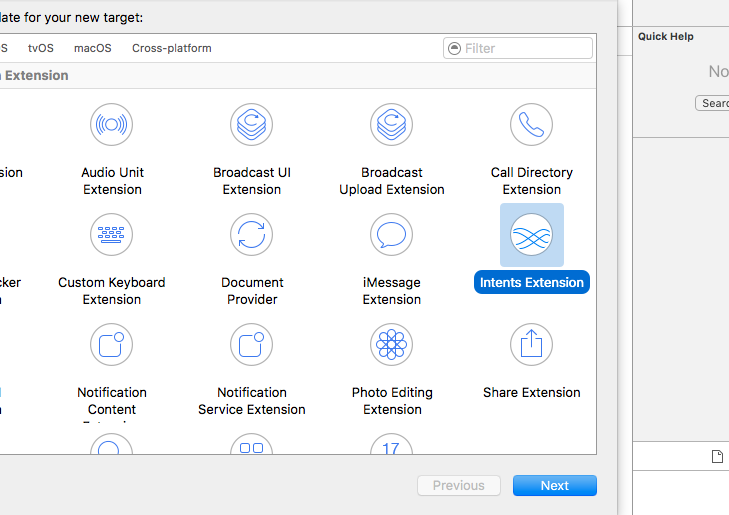 This will add the Siri Intents Extension to your existing project. 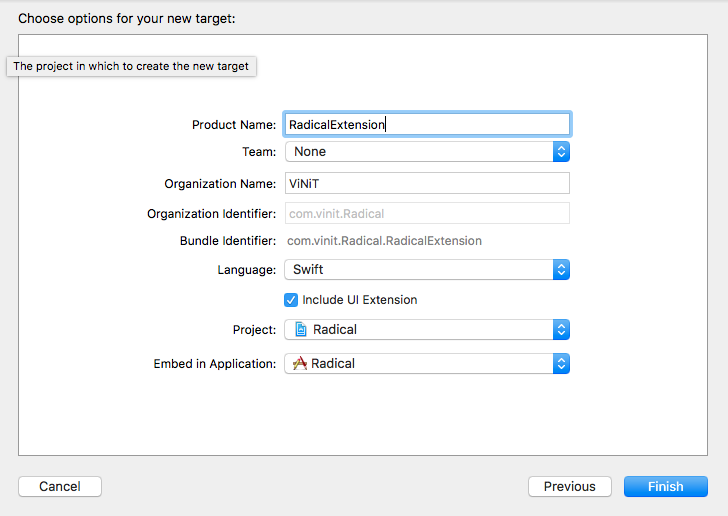 On the next screen you will provide a product name which in our case it will be “Radical Extension”. Make sure you tick the Include UI Extension box if you want to have your own custom view in siri. The NSExtension of Siri has 3 methods supported namely INSendMessageIntent, INSearchForMessagesIntent and INSetMessageAttributeIntent. 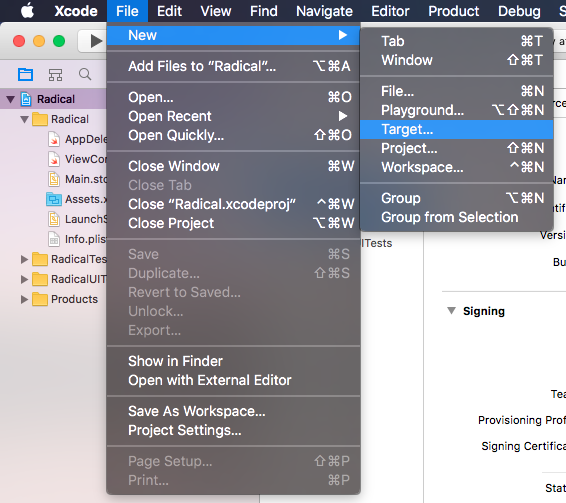 In this tutorial we are not searching any existing message intents or setting attributes to it, so we will remove those to items from our Info.plist file of the RadicalExtension folder as show below. This is how the class with look now after removing other two. So now we need to test whether Siri recognizes our app or not. So just build the project and run it on an actual device. Note: It will not work on simulator as Siri is not supported. 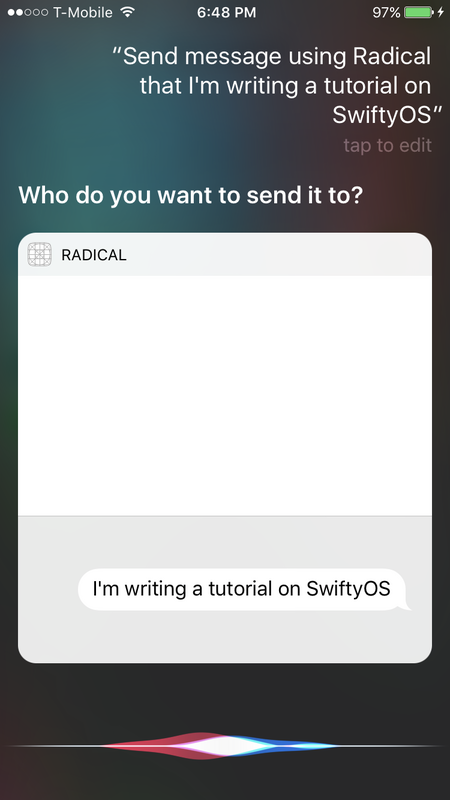 When you run the app on your actual device you will see a blank white screen, don’t worry about that just long press the home button to activate Siri and say something like “Send message using Radical”. 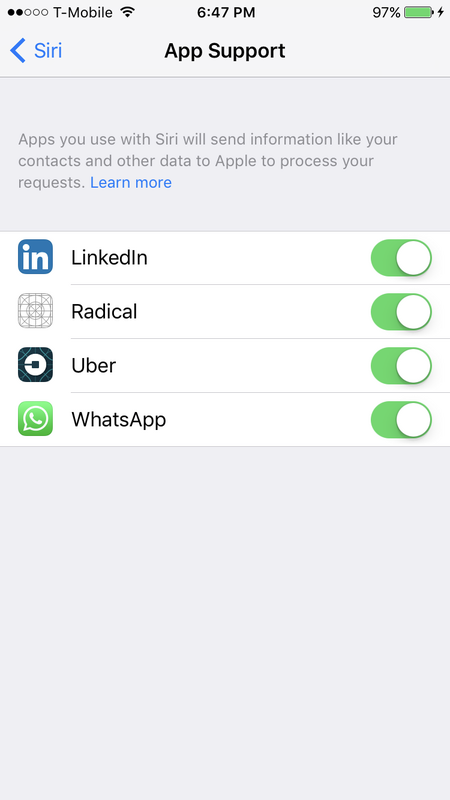 At this stage it will prompt to access your Radical app data and give a button to open Siri Settings. 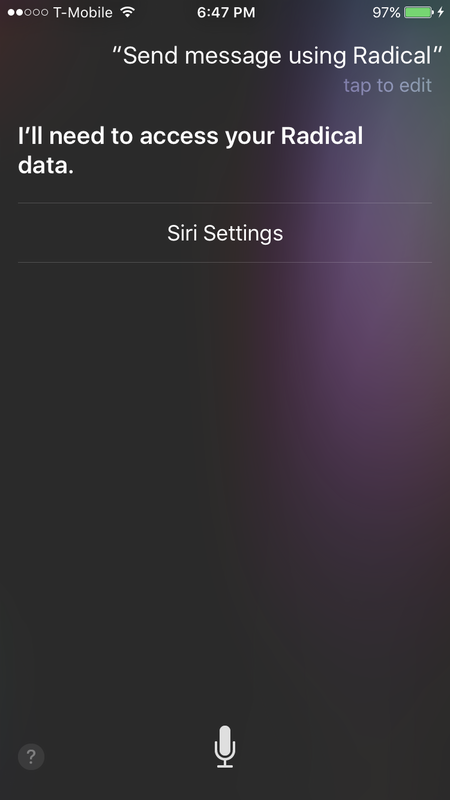 You need to turn on the switch located next to your app in Siri Settings. You will see something like this in the image above. Wee congrats you have set up Siri for your message application. Now the UI doesn’t seem to be nice enough. For a better user experience there should be same UI as the actual messaging window, the user is always set to imagine a standard UI for certain messages app used daily. Whenever they send a message through Siri, they expect a similar UI view for the Siri Message Box as well. Hence it is also important to design Siri UI view which will be done in sometime. Apple provides a different storyboard named MainInterface.storyboard with a Intent ViewController for Siri. 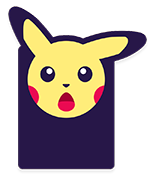 We will change the background, add a nice pikachu icon, the message bubble and a UILabel that will show the message. You can get these icons from here and here. In the resolveRecipients function we removed the recipients results array and initialization. What this does is it checks whether there is any recipient value for the message or no and accordingly prompt the user for a value. It also has a switch case which is activated if there are more then one recipients with same value, for eg. same first name. So when I say “Send a message to Jon using Radical” and if there is more than one person named Jon in the contacts then it provide a tableview with all possible Jon’s to select a single user. In our case we don’t have a full fledged message app nor any contacts, so we rewrite it to personResolutionResult not required and complete anyway. For the resolveContent function it remains the same where it checks whether the user has provided some content for the message. If content is provided then complete with a success method passing the message and if not provided then Siri will prompt the user to provide content for the message. The handle function handles the actual app logic for sending the message to the servers and eventually to other person’s device. Now if you run the app in current position, you will see your custom ui view in siri with a standard messaging siri ui provided by apple attached at the bottom. We need to remove that view and use just our ui view. For achieving this we set a value for the variable displaysMessage to true which indicates the system that we have our own view and would like to remove the standing messaging view. Now we also link the UILabel that we had set while setting up the storyboard to our IntentViewController class. To do this, open the storyboard for the Siri view and an assistant editor. Press ctrl+drag the UILabel to the assistant editor and drop for linking it as an outlet with name messageLabel. 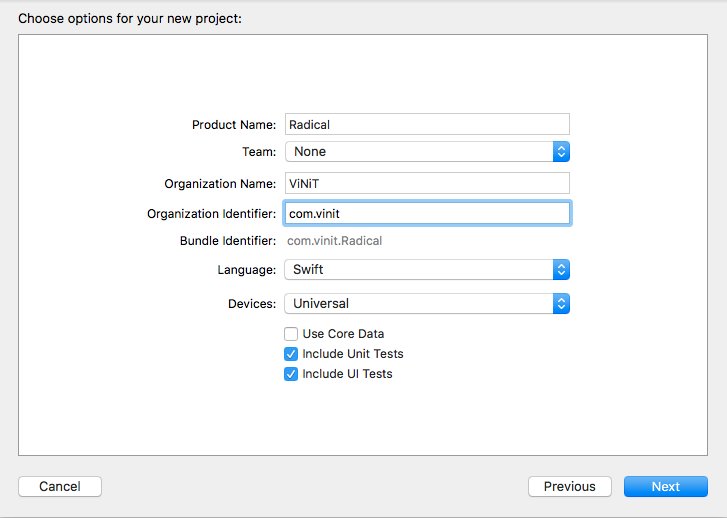 // Do configuration here, including preparing views and calculating a desired size for presentation. In the code above we create a constant variable intent which stores the INSendMessageIntent interaction content in it. 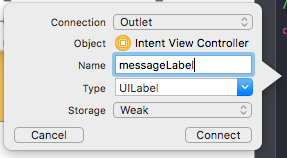 We then assign the label text to intent.content for the message string. This was the last piece of code to be added and voila! you are done with the basic siri implementation to your messaging application. 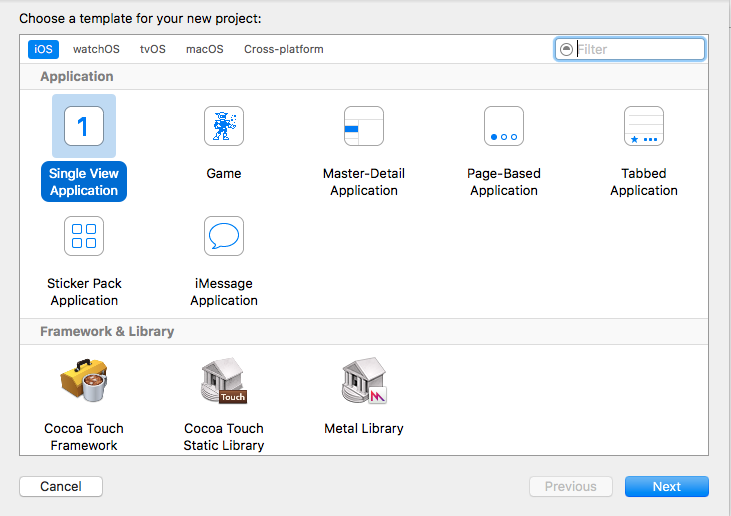 So now you run the app with the big “Play” button in the top left of Xcode. You then need to set actual iOS device to run the app on (requires a paid developer license). I used my iPhone 7 for this simulation. Then wait a bit until the code is compiled and the binaries are installed on the device. 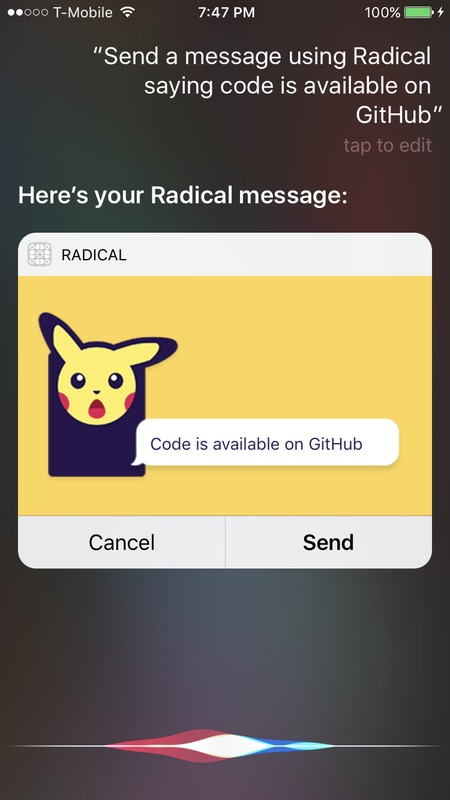 Once the app is open on your device, long press the home button and say “Send a message using Radical saying code is available on GitHub” and you will see a nice message box as shown below. Great Stuff!! Had been waiting a long time for a new post!! Love these tutorials!! Thank you!